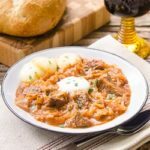 Szegendiner Gulasch (German Sauerkraut Beef Goulash) is a healthy, comforting stew flavored with paprika and served with a dollop of sour cream. Place beef cubes in a large bowl. Sprinkle 2 tablespoons sweet paprika and hot paprika on the beef. Drizzle vegetable oil over beef. Stir to coat beef cubes with paprika and oil. Cover and chill for 1 hour. Heat 2 tablespoons lard in a large Dutch oven or soup pot over medium heat. Working in batches, add the beef to the pot and brown on all sides. Do not brown the beef all at once. Note paprika browns quickly and so watch over it and turn beef cubes before it blackens/burns. Transfer browned beef to a plate or bowl. Add 1 tablespoon of lard to the pot if needed (if the pot looks "dry" and does not have a layer of melted lard in the bottom). Add onion slices, 1/2 teaspoon salt, and 1/4 teaspoon pepper to the pot and cook until onions have softened, stirring occasionally, about 5 minutes. Add garlic, stir, and cook for 1 minute. Add tomato paste, beef broth, wine, and remaining 1 tablespoon sweet paprika, 1/2 teaspoon salt, and 1/4 teaspoon pepper. Stir to combine. Add browned beef and any accumulated juices back to the pot. Add enough water to just cover the beef. Stir. Bring to a boil then lower heat to simmer. Cover and simmer for 1 hour. Add drained sauerkraut. Stir. Cover and simmer for 30 minutes. Stir together cornstarch with about 1 tablespoon cold water to make a slurry. Slowly pour in the cornstarch slurry while stirring. This will thicken the sauce. Cook for 2 minutes. For best results, cool to room temperature then chill overnight in a sealed container. Re-heat prior to serving. The flavors will develop further and sauerkraut will mellow. You can also serve it on top of egg noodles or spaetzle or with boiled potatoes if desired. Time stated does not include chilling beef with paprika for 1 hour.